Fitness equipment problems are no sweat for the Fitness Equipment Specialist. We strive to provide the best quality service on your equipment. Let Fitness Equipment Specialist service your equipment by fixing the squeaks and noises, tightening all the hardware, and giving it a thorough top to bottom physical and visual inspection. We're able to fix it up, tighten it up, and get it back into a functioning state. Give us a call about the problems you're having with your equipment and let us give you a free initial assessment and quote over the phone toll free at 886-787-5344. Then, we're on our way to service your machines and make any necessary repairs, so that it is operating safely and to your satisfaction. All services are done in home - quick, simple and seamless with our mobile service vehicle. Be sure to get in touch with us when you're planning on moving. Our technicians are available to come to you and disassemble your equipment and safely move it to another part of your home, office or to a new location. Our moving service also furnishes the transportation of the equipment to any location, as well as putting it all back together in proper operating condition. Trust the professionals to do it right! 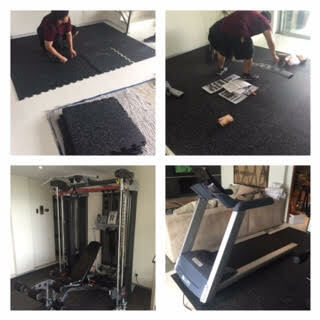 We offer in-home installation and setup of all types of exercise equipment from manufactures and distributors of exercise fitness equipment. We offer a complete White Glove Package Delivery option with inside placement of products, unpacking and removal of debris, old machines and a complete run through on how to use the equipment. No install is too small or big. Contact our fitness equipment service team today to learn about what type of service is right for you.